Transactions reached $16.5 billion. That’s 38 per cent more than the previous record, set in the first quarter of last year, and more than twice the five-year quarterly average, CBRE Group Inc. said in a report Monday. Deal volume for the first six months was $26.8 billion, a half-year record. Two large purchases that closed in the second quarter dominated the action -- Choice Properties’ acquisition of Canadian Real Estate Investment Trust, and Blackstone Property Partners’ purchase of Pure Industrial Real Estate Investment Trust. Together the deals accounted for 45 per cent of the total. Single-property purchases included Hines and Oaktree Capital Management’s $107 million purchase of the First Tower office building in Calgary and Tigra Vista Inc.’s $256 million acquisition of Toronto’s Parkway Place. The average deal size was $9.4 million, up 67 per cent from a year earlier. Toronto accounted for more than a third of all transactions in the quarter, at $5.7 billion. That’s the city’s highest quarterly investment volume ever and 20 per cent more than the previous record, set in 2013. Vancouver had more than $3.2 billion in transactions, nearly double its five-year average. 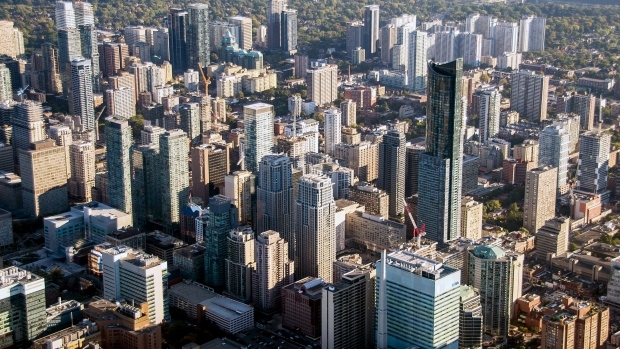 Toronto and Vancouver have had the two tightest downtown office-vacancy rates for four quarters in a row and the two lowest industrial-availability rates for six consecutive quarters in North America, Senst said in a statement. Industrial sales outperformed all other assets, largely due to Blackstone’s acquisition of more than 25 million square feet of industrial properties across Canada and the U.S. Deals in this segment represented 37 per cent of investment volume, at $6 billion, another record. Apartment-building deals also performed well, with $1.9 billion in transactions, 40 per cent more than in last year’s second quarter.